I’ve posted this picture and some others on twitter and flickr in the last few days. One of the new works to be presented at my upcoming show at Toy Art Gallery, La will be a series of tiny blind boxed figures. 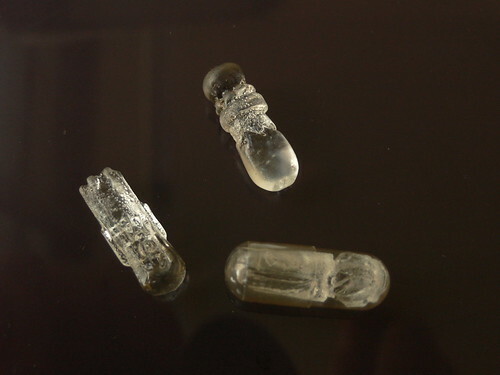 The sculptures are made in a way that they will fit into a regular 00-sized transparent gelatine capsule. 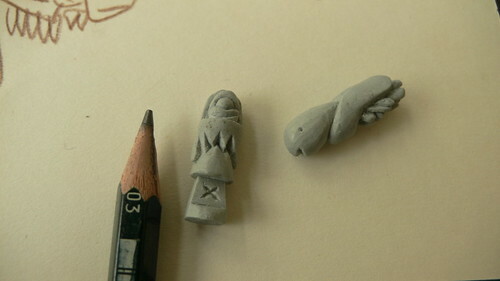 Today I made a first test cast and the result was semi-successful. There are still a lot of bubbles on the surface of the casts. The material I used is not resin but isomalt, a sugar substitute that is used in a wide range of pharmaceutic and diet products as well as in patisserie and sugar casting art. I have yet to figure out how to cast without any bubbles. Oiling the silicone helps but does not remove all bubbles. It is interesting to note that the bubbles usually only happen on the surface and not on the inside of the isomalt. And if you’ve been wondering… yes, this whole toy is eatable. All materials used, even the silicone is safe to be used with food. Swallow it and you will never see it again.